A newspaper article published by The Central Florida Press on June 20, 1930. The article reports construction figures compiled by the state hotel commission for the month of May. According to the article, the total sum of money expended for the construction of hotels, apartments, and cafes was $557,725. Over half of that amount was due to construction in South Florida, while Central Florida had expenditures of $183,400 in Orlando and Sanford. Thirty-four permits were issued in May for 10 hotels, nine apartment houses, two rooming houses, and 13 cafes. Original newspaper article: "Construction is on the Upgrade: Total of $557,725 in Hotel Building." The Central Florida Press, Vol. 1, No. 9, June 20, 1930, page 1: Oviedo Historical Society, Oviedo, Florida. 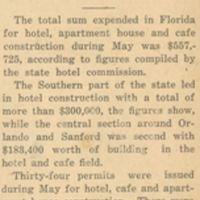 Digital reproduction of original newspaper article: "Construction is on the Upgrade: Total of $557,725 in Hotel Building." The Central Florida Press, Vol. 1, No. 9, June 20, 1930, page 1. “Construction is on the Upgrade: Total of $557,725 in Hotel Building.” RICHES of Central Florida accessed April 25, 2019, https://richesmi.cah.ucf.edu/omeka/items/show/5684.